Sometimes I hear “laser technicians” brag about how many treatments they’ve done with their P.O.S. Q-switched laser. I saw one the other day that said “over 250,000 treatments” performed. You notice they don’t equate that to actual complete tattoo removals. 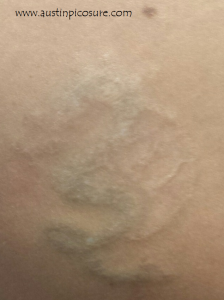 I see numerous patients that have had ten or more treatments and they’re left with horrible scars and residual ink that I call “tattoo remnants”. Yesterday I saw one such patient who had lost count after she’d received 25 treatments! That’s got to be the most I’ve ever seen. Her scarred tattoo remnant is below for you to see. Luckily for her, I will be able to remove the residual ink and break up the scar at the same time using the revolutionary PicoSure laser. How is that possible? Well, because the PicoSure pulses 100 times faster than a Q-switched laser it is much more effective and gentler on the skin. You see, the slower a laser pulses, the more it heats up and damages the skin which results in scarring. Fortunately, the PicoSure laser is also FDA approved for scar rejuvenation. 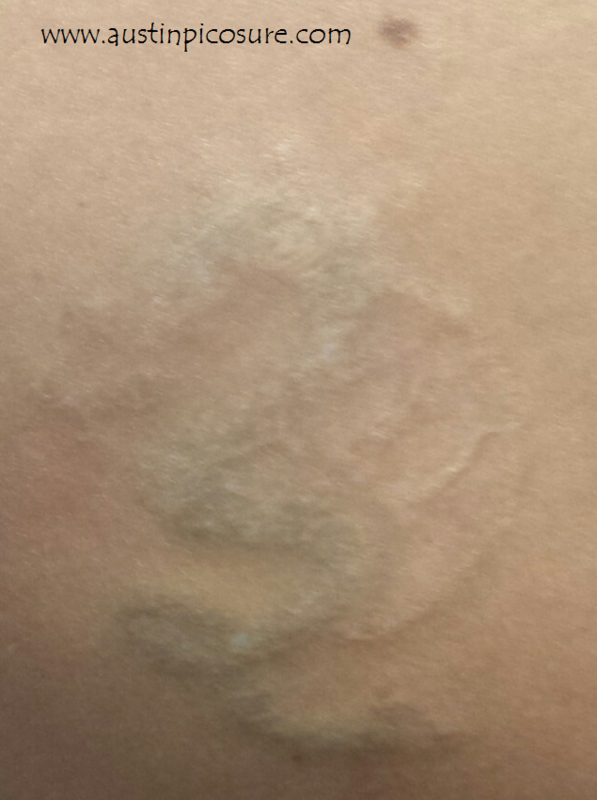 Scarring from a POS Q-switched Laser – 25 Treatments! The PicoSure laser is the best method available for safe, fast and effective tattoo removal. No other instrument or treatment has been shown to be its equal. In fact, most other methods are dangerous or will leave scarring and hideous residual ink. If you’re living with a tattoo remnant and you’ve been treated numerous times without success, then you know just what I’m talking about. If you’d like to finally get it off I can be reached by phone @ 512-479-9997 or just stop by my NEW location in Austin, TX: Austin Medspa on W. 6th St.